Oceanfront! Mary's Dream; 4 Bedroom, 2 Bath, 2 Sundecks & 1 covered porch! Welcome to a legend on Edisto Beach; Mary's Dream! A four bedroom, two bath, wonderful oceanfront cottage with all the up-to-date amenities yet retaining the classic charm of days gone by! Relax and enjoy ocean anywhere you like; under the covered porch which spans the entire oceanfront or on our sundeck. Our sundeck wraps around the entire oceanfront and the SUNDECK ALONE IS 1500 SQUARE FEET! THIS HOUSE RENTS SUNDAY TO SUNDAY DURING L SUMMER< Is only rented during season. Cook your own seafood from the local docks with our fully-equipped kitchen. Watch the pelicans from the great room, enjoy your coffee from the master suite, or step outside the master suite door onto the deck and enjoy the morning. Stroll along the beach in the evening or relax in one of the rocking chairs and enjoy the quiet serenity of Edisto with panormamic oceanfront views. Our master suite offers private access to beach for those wonderful private strolls under the stars. All of our bedrooms have ocean views as does every room in the house with the exception of one room: the guest bathroom! This is the beach house of your childhood but she now has central heat and air conditioning and huge wrap around decks with all of the original hardwood floors lovingly restored and now gleaming... Kick off your shoes! Our weekly rate is for Sunday - Sunday weeks and if that won't for you we also have nightly rates to try to help you with your schedule. Below are a few comments from our guests; we sincerely appreciate it! We just got back home yesterday and wanted to go back to the Island already but we have to work. We had a great time again this year. Its hard to believe its been 12 years since we stayed at Mary's Dream for the first time on our honeymoon in 1999 and we have not missed a September full moon since then. The minute we unpack when we get there we feel just like it's our home too; we love this place! Thank you so much for creating such a lovely environment for us to share.We LOVE it!!! Rick, Jake and I are thrilled to be here. Jake took his first dip in the ocean today. We have enjoyed cooking in the kitchen, the views, and the tasteful decorating touches. We look forward to the remainder of our stay. I just wanted to let you all know...This is paradise. Take care. Helene, Rick & Jake. What a GREAT cottage...I love how light and airy it is and how all the rooms are arranged so you can see the water and hear the waves crash...wonderful!!!! Thank you for sharing your house!! I just wanted to let you know what a wonderful time we had at Mary's Dream last week. The oceanfront views, the best porch around, the coziness of the house....it was wonderful! We look forward to staying with you again! We must be living right!! What a wonderful 2 weeks we had in Mary's Dream. Sun every day - temp. 70-80. The house was in great shape and we look forward to our two weeks again next year. Just wanted to let you know we definitely want to again reserve the last week of April and first week of May in 2008 and if the second week in May becomes available please let us know. We wanted to say Thank You So Much for allowing us to rent your wonderful beach home. Mary's Dream is the perfect beach house. We never wanted to leave even to venture out. The front porch was just heaven. I am sure we will be contacting you again soon! We chose to stay in Edisto so we could visit our son who is stationed at the Marine Corps Air Station in Beaufort. We had everything we needed at Mary's Dream, from wi-fi for my college student to fishing for my son in the Marine Corps, beach combing and boogie boarding for the 10 year olds, not to mention the historical sites and the kayaking trip, we all found plenty to do and thoroughly enjoyed our stay. The house was clean and comfortable and exceeded our expectations. We loved the non-commercialized environment on Edisto Island. The people were so friendly. We can't wait to come back next year. Thank you Richard and Mary for the best vacation we have ever taken! if you would like our Concierge service will take care of your linens for you which you can rent. Electric fireplace! Just push a button!! You can rent your towels from us or bring your own. Leather sections sofa, expansive views of beach and ocean, 180 degree view! 5 tv's, all hooked to cable except one which has a dvd player in it for kids. Have a small collection of books for your enjoyment. Collection has approx. 50 plus books at this time. large ocean facing decks on both sides of the house as well as a covered deck the length of the living room/dining room area. Inside Wyndham Resort which will at this time sell you a pass for one or for your family. They control availability and pricing. There is a public course inside the Wyndham Resort. Fabulous week for our family at Mary’s Dream! Our extended family of 7 plus three small children had the most wonderful week together! We loved the proximity of the house to the beach and the great windows to see the ocean view! The wrap around porch was awesome especially at night watching the stars and listening to the ocean! Typical beach house layout fit for accomodating large family. The dunes in front are high and made it a challenge getting to the beach for us old folks with knee problems. Does not show this in the pictures online. Beautiful views and location is convenient to stores and restaurants. Edisto is our favorite beach as it is a laid back destination with no crowds. Got to witness the turtle patrol bury and document an egg laying. 87 eggs. Would love one day to see a turtle crawl. This was very near our beach house. Overall, our week at Mary’s dream was a dream vacation. Thank you for taking the time to share how much you enjoyed our "Mary's Dream. We have not updated the pictures to show the dunes since they actually run the entire length of Edisto Beach now and we are so happy to have them to help us in the event of another bad storm. I just wanted to write you all and let you know how much we enjoyed Mary’s Dream and our Edisto vacation. It was certainly the best vacation we have had in some time. The home was wonderful, the beach was wonderful, and Edisto was amazing. We hope to be able to book a week again next year. We rented Mary's Dream for our yearly family vacation. We live in the Charleston area and were very aware of Edisto but had not vacationed there. We found Mary's Dream on the VRBO website (among others) and fell in love. The process of renting the home was efficient and very friendly. Richard and Brittany were helpful in so many ways from start to finish. The home itself is lovely and has amazing character. When they list it as "beachfront" they mean it. The ocean is visible from almost every vantage point in the home. We made it a habit to get up every morning for the sunrise and coffee from the front porch. The porches are amazing, the beds are comfortable, and the furniture/appointments are perfect for your vacation. Edisto is laid back and friendly. Everyone we encountered on the beach, at Sea Cow, at George and Pinks, Kings, BiLo, etc were wonderful. A great family vacation location and a true vacation home we plan on returning to whenever we can. Thank you both for helping us to have such a wonderful week at Mary's Dream. The house itself was perfect. And I can't thank you enough for making the booking process itself so easy. My husband and I laughed that we don't feel like we know the island very well because we couldn't tear ourselves away from the porch! We decided that Mary's Dream needs to become part of our Vacation Rotation and we hope to return for a visit soon, certainly in the next year. I wanted you to see how much our sweet Popsie enjoyed his stay as well. You'll also see his very small cousin Fenway there beside him on his bed. They both loved the porch! Thank you again for a wonderful vacation! We had a WONDERFUL time! A perfect beach house! We flew across the country to stay on a beach we had never heard of because we wanted to stay in a secluded family beach that we could swim on in October. We were looking for the perfect beach house directly on the oceanfront without a lot of stairs with all the living area on one level that would sleep all 12 of us and we certainly found it in Mary's Dream. 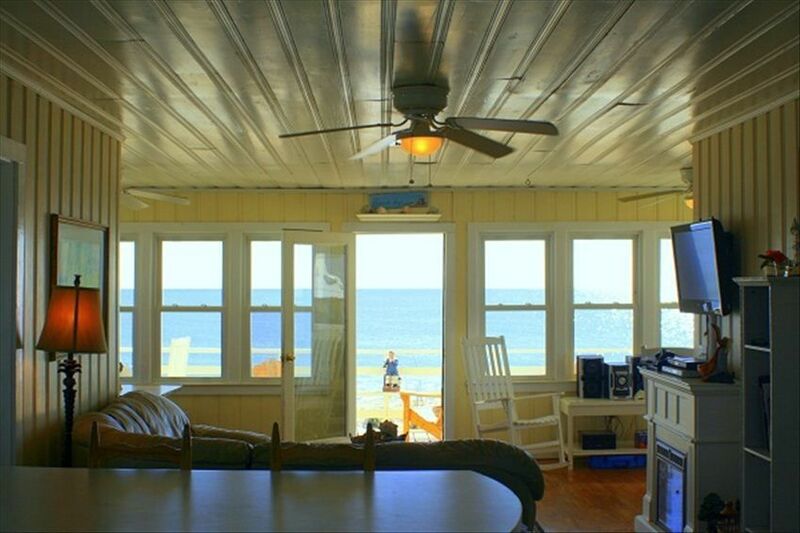 This home is the beach cottage you read about in family beach novels but with the addition of air conditioner. We did not use it much though; we opened up all of the windows and the breeze was great! The pull out sofa bed became a real attraction! It is surrounded by white curtains and has a memory foam mattress (I've never seen a sofa bed with a memory foam mattress so I have to think they retrofitted it for this) and is surrounded by windows opening to the ocean. Two of us slept on it at night but we left it out around the clock and have many pictures of several of us who wandered over and laid down "for just a minute" but ended up taking a nap. TO TAKE ADVANTAGE OF THE WEEKLY RATES YOUR RESERVATION MUST BE SUNDAY - SUNDAY. IF THAT WILL NOT WORK FOR YOU THEN WE WILL ACCOMMODATE YOU AT THE NIGHTLY RATE IF WE POSSIBLY CAN. Holidays are extra. Dog fee is per dog. Rates are subject to change without prior notice and your reservation is not considered confirmed until we have received your payment and signed Reservation Agreement. We will refund your rental amount IF we are able to re-rent out your reserved time minus 10% and possibly credit card fees. Check in and out days are always Sunday.